The Federal Trade Commission today announced a law enforcement initiative stopping national marketers that used deceptive advertising claims to peddle fad weight- loss products, from food additives and skin cream to dietary supplements. “Operation Failed Resolution” is part of the FTC’s ongoing effort to stop misleading claims for products promoting easy weight loss and slimmer bodies. 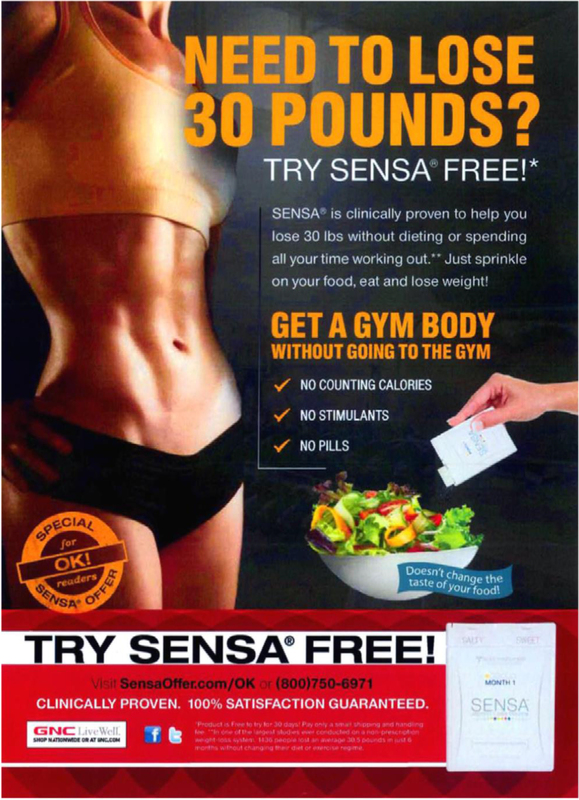 The marketers of Sensa, who exhorted consumers to “sprinkle, eat, and lose weight” – will pay $26.5 million to settle Federal Trade Commission charges that they deceived consumers with unfounded weight-loss claims and misleading endorsements. The FTC will make these funds available for refunds to consumers who bought Sensa. 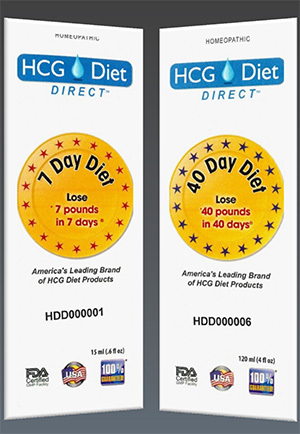 HCG Diet Direct, which marketed an unproven human hormone that has been touted by hucksters for more than half a century as a weight-loss treatment. And it announced a partial settlement in a fourth case, LeanSpa, LLC, an operation that allegedly deceptively promoted acai berry and “colon cleanse” weight-loss supplements through fake news websites. In total, the weight-loss marketers will pay approximately $34 million for consumer redress. In addition to the $26.5 million to be paid by Sensa, L’Occitane, Inc. will pay $450,000, and the LeanSpa settling defendants will surrender assets totalling an estimated $7.3 million. The judgment against the HCG Diet Direct defendants is suspended due to their inability to pay. Refund administration for consumer redress takes time, and the FTC is in the process of determining how best to provide redress in each case. When information becomes available regarding consumer refunds in these cases, it can be found here. UPDATES ABOUT THE SENSA REDRESS PROGRAM CAN ALSO BE ACCESSED BY CALLING 800-420-2914. 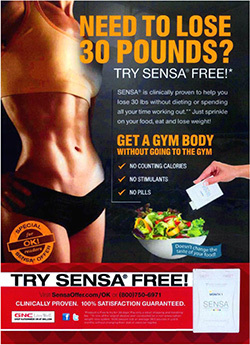 The FTC charged that California-based Sensa Products, LLC, its parent, and two individuals deceptively advertised that the powdered food additive Sensa enhances food’s smell and taste, making users feel full faster, so they eat less and lose weight, without dieting, and without changing their exercise regime. The defendants did not have competent and reliable scientific evidence to support these claims, according to the FTC’s complaint. The defendants typically charge $59 plus shipping and handling for a one-month supply of Sensa. They provide the powder in twelve flavors, and have marketed it through radio and print advertisements, retail chains such as Costco and GNC, a promotional book, television ads and infomercials, Home Shopping Network, ShopNBC, telemarketing, and the Internet. U.S. sales of Sensa between 2008 and 2012 totaled more than $364 million, according to the complaint. In addition to Sensa Products, LLC, the FTC’s complaint names parent company Sensa, Inc., Sensa Inc. former CEO Adam Goldenberg, and Sensa creator and endorser and Sensa Products part-owner Dr. Alan Hirsch with deceptive advertising for making unsubstantiated claims about Sensa. The FTC also charged that the defendants failed to disclose the fact that some consumers were compensated for their endorsements of Sensa. In some instances, compensation included payments of $1,000 or $5,000, and trips to Los Angeles. The agency also alleged that Dr. Hirsch – who conducted two of the studies cited in the ads and wrote a promotional book about Sensa – gave expert endorsements that were not supported by scientific evidence, and provided the means for the other defendants to deceive consumers. The defendants falsely cited Dr. Hirsch’s studies as clinical proof that consumers could lose substantial weight without dieting or exercise. The defendants also allegedly misrepresented their role in a third study. Under the order, the defendants are barred from making weight-loss claims about dietary supplements, foods, or drugs, unless they have two adequate and well-controlled human clinical studies supporting the claims; making any other health-related claim unless it is supported by competent and reliable scientific tests, analyses, research, or studies; and misrepresenting any scientific evidence. They also must disclose any material connections with the endorsers of a product or program, as well as with anyone conducting or participating in a study of the product or program. Dr. Hirsch is also barred under the order from providing expert endorsements unless he relies on both competent and reliable scientific evidence and his own expertise. And he is barred from providing to others studies, promotional materials, endorsements, or other means for deceiving consumers. The order imposes a $46.5 million judgment against the companies, and requires them to pay $26.5 million, with the rest suspended due to their inability to pay. If it is later determined that the financial information the defendants gave the FTC was false, the full amount of their judgment will become due. The Federal Trade Commission has reached a settlement requiring L’Occitane, Inc. to stop making deceptive claims that its Almond Beautiful Shape and Almond Shaping Delight skin creams have body slimming capabilities and are clinically proven. 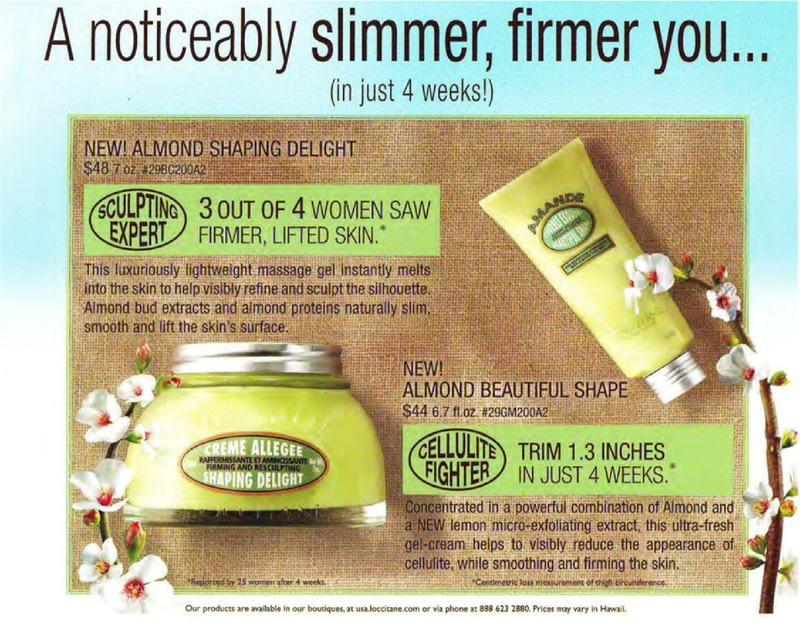 The online and in-store retailer of beauty and cosmetic products – which charged $48 for 7 ounces of Almond Shaping Delight and $44 for 6.7 ounces of Almond Beautiful Shape – also has agreed to pay $450,000 for consumer redress as part of the settlement. The proposed settlement bans the company from claiming that any product applied to the skin causes substantial weight or fat loss or a substantial reduction in body size; prohibits the company from claiming that any drug or cosmetic causes weight or fat loss or a reduction in body size, unless the claim is backed by two adequate and well-controlled human clinical studies; requires that any claim that a drug or cosmetic reduces or eliminates cellulite or affects body fat or weight be backed by competent and reliable scientific evidence; and prohibits the company from misrepresenting the results of any test, study, or research, or that the benefits of a product are scientifically proven. The Arizona-based company HCG Diet Direct, and its director Clint Ethington, marketed liquid homeopathic hCG drops by falsely promising they would cause consumers to rapidly lose substantial weight. The defendants have agreed to enter into a settlement with the Federal Trade Commission that would bar such deceptive claims in the future. 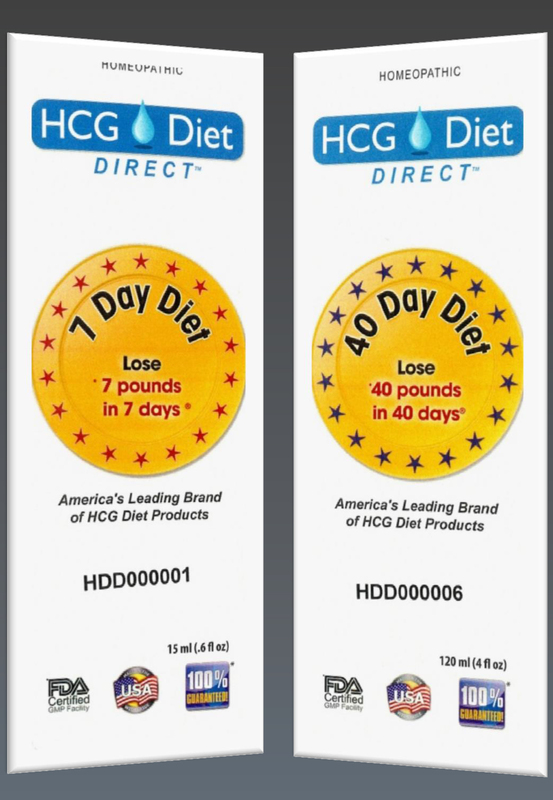 The defendants sold HCG Diet Direct Drops, a diluted liquid form of human chorionic gonadotropin – a hormone produced by the human placenta that has been falsely promoted for decades as a weight-loss supplement. In November 2011, HCG Diet Direct and 6 other companies received warning letters issued jointly by FTC and FDA staff, advising that their hCG products are mislabeled drugs under the FDA Act, and warning that it is unlawful under the FTC Act to make weight-loss claims that are not substantiated by competent and reliable scientific evidence. In advertisements on YouTube videos, through product packaging, and in statements and testimonial videos posted on the company website, the company claimed that consumers would rapidly lose substantial amounts of weight (up to one pound a day) by placing a highly diluted concentration of homeopathic HCG solution under their tongues before meals and adhering to a very low calorie diet. According to the FTC, the company and its director also made several other false and unsupported claims, including that the product was FDA approved, and failed to disclose that endorsers appearing in some of its advertisements were compensated, or were related to a company employee or officer. The company charged approximately $35 for a 7-day supply or $200 for a 40-day supply of their HCG Diet Direct Drops, with sales totaling more than $3 million – mostly between January 1, 2009, and late 2012. The proposed settlement bars HCG Diet Direct and Ethington from claiming or assisting others in claiming that any dietary supplement, food, or drug causes weight loss, or that consumers who use the product can expect the same results as endorsers – unless the claim is non-misleading, and unless the defendants have at least two adequate and well-controlled human clinical studies to substantiate their advertising claims. The order also bars the two defendants from making any other health claims about any dietary supplement, food, or drug unless they have competent and reliable scientific evidence; misrepresenting the results of scientific research; representing that a product is FDA-approved when it is not; and failing to disclose that endorsers are related to company officials or that they are being compensated for their testimonials, if that is the case. The order imposes a $3.2 million judgment, representing all sales of HCG Diet Direct Drops, which is suspended based on the defendants’ inability to pay. If it is determined that the financial information the defendants gave the FTC was untruthful, the full amount of the judgment will become due. The FTC has reached a settlement requiring LeanSpa principal Boris Mizhen and three companies he controls to surrender cash, real estate and personal property totaling approximately $7 million. Mizhen’s wife, Angelina Strano – charged as a relief defendant who accepted money from the scheme but did not actively participate in it – will surrender nearly $300,000. In December 2011, the FTC and the state of Connecticut shut down Mizhen’s operation, charging it with using fake news websites to promote acai berry and “colon cleanse” weight-loss products, making deceptive weight-loss claims, and telling consumers they could receive free trials of the products by paying the nominal cost of shipping and handling. The FTC alleges that many consumers ended up paying $79.99 for the trial, and for recurring monthly shipments of products that were hard to cancel. The FTC charged the defendants with violating Sections 5 and 12 of the FTC Act, the Electronic Funds Transfer Act, and Regulation E, and the state of Connecticut alleged that the defendants violated the Connecticut Unfair Trade Practices Act. The defendants also are required to have at least two human clinical trials to support any weight loss claims they make about the products they sell, and to have competent and reliable scientific evidence for any other health claims. They are prohibited from claiming that products are clinically proven when they are not, and from violating the Electronic Funds Transfer Act. Litigation continues against defendants that acted as LeanSpa’s affiliate network, and two other relief defendants. Consumers should carefully evaluate advertising claims for weight-loss products. For more information, see the FTC’s guidance for consumers of products and services advertised for Weight Loss & Fitness. The FTC also has new guidance for media outlets on spotting false weight-loss claims in advertising. The FTC is a member of the National Prevention Council, which provides coordination and leadership at the federal level regarding prevention, wellness, and health promotion practices. This initiative advances the National Prevention Strategy’s goal of increasing the number of Americans who are healthy at every stage of life. The Commission votes authorizing the staff to file the complaints and approving the proposed consent decrees for Sensa Products, LLC; and HCG Diet Direct and Clint Ethington were both 4-0. The FTC filed the complaint and proposed consent decree for Sensa in the U.S. District Court for the District of Illinois on January 7, 2013, and for HCG Diet Direct in the U.S. District Court for the District of Arizona on January 7, 2013. The proposed consent decrees are subject to court approval. The Commission vote approving the proposed consent decree for Leanspa, LLC; NutraSlim, LLC, NutraSlim U.K., Ltd., Boris Mizhen, and relief defendant Angelina Strano was 4-0. It is subject to court approval. The FTC filed the proposed consent decree in the U.S. District Court for the District of Connecticut on December 23, 2013. NOTE: The Commission files a complaint when it has “reason to believe” that the law has been or is being violated and it appears to the Commission that a proceeding is in the public interest. Consent decrees have the force of law when approved and signed by the District Court judge. The Commission vote to accept the consent agreement package containing the proposed consent order for public comment in the L’Occitane, Inc. case was 4-0. The FTC will publish a description of the consent agreement package in the Federal Register shortly. The agreement will be subject to public comment for 30 days, beginning today and continuing through February 6, 2014, after which the Commission will decide whether to make the proposed consent order final. Interested parties can submit written comments electronically or in paper form by following the instructions in the “Invitation To Comment” part of the “Supplementary Information” section. Comments in electronic form should be submitted using the following Web link: https://ftcpublic.commentworks.com/ftc/loccitaneconsent, and following the instructions on the web-based form. Comments in paper form should be mailed or delivered to: Federal Trade Commission, Office of the Secretary, Room H-113 (Annex D), 600 Pennsylvania Avenue, N.W., Washington, DC 20580. The FTC is requesting that any comment filed in paper form near the end of the public comment period be sent by courier or overnight service, if possible, because U.S. postal mail in the Washington area and at the Commission is subject to delay due to heightened security precautions. Commissioner Ohlhausen and Commissioner Wright have issued separate statements pertaining to these matters, as well as to the separate matter of GeneLink; Chairwoman Ramirez and Commissioner Brill issued a joint statement pertaining to GeneLink. Sensa Products, LLC, et al.